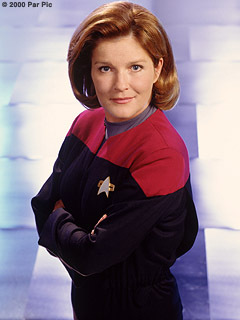 Captain Kathryn Janeway, played by Kate Mulgrew, is the commanding officer abord Voyager. She was raised in Indiana, Earth. Kathryn has one sister, Phobe. She is the daughter of Admiral Edward Janeway and his wife Gretchen. Kathryn's father and fiance, Justin, were killed when the shuttle they were testing crashed on Tau Ceti Prime. She was the only survivor. On Kathryn's first deep space mission under Admiral Owen Paris she was captured and held in a cardasian prison. She left her fiance, Mark, and her dog, Molly, back in the Alpha Quadrant. Kathryn has no childen, although she feels like a mother to most of her crew. She has been known to be stubborn on more than one occasion. She was even relentless enough to beat Death itself when an alien life form tried to take her into his matrix. She has taken on the Borg, the Kazon, Species 8472, and the Hirogen. She is seriously addicted to coffee. Captain Janeway is a strong and dedicated leader and , many say, the strength behind Voyager. She has dedicated her life to her ship, and to getting her crew home. 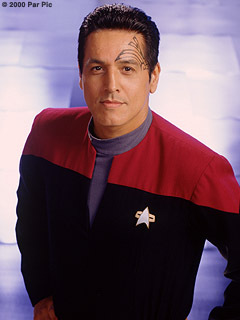 Commander Chakotay, played by Robert Beltran, is Voyager's first officer. He was raised in the steep traditions of his tribe. He resisted his father's attempts to teach him to embrace his heritage. He left the tribe to attend Starfleet Academy without the blessings of his father. Chakotay's family was killed by the Cardassians along with the rest of his gentle native-american people. His anger drove him to resign from Starfleet, where he was a Lt. Commander, and join the Maquis. He was the captain of the Maquis freedom fighter vessel, Liberty, until it was pulled into the Delta Quadrant by the Caretaker. Chakotay destroyed his ship to aid Captain Janeway in the destruction of the Caretaker's array. He then joined forces with her, and she asked him to serve as her first officer. Chakotay is the son of Kolopak. He bares a tribal tattoo in honor of his father. He has no children. Commander Chakotay is a strong but gentle man. He serves Captain Janeway honorably and loyally. He is a constant source of strength to her.